This year will be the first Masters stages at Alexandra Palace in London, runs from January 15 to 22, 2012. We have been patiently waiting for the 2011 Masters Draw and it came out yesterday. Ding Junhui was the first Chinese player to win the biggest invitational event The Masters last year, by beating Marco Fu 10-4 in the first ever all Asian final. 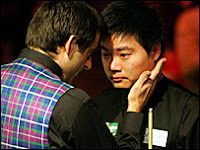 The defending road of Ding is difficult this year because he will face Ronnie O'Sullivan in the first match. Ding met Ronnie in his first Masters final four years ago but suffered a 3-10 defeat. During the final, the violent crowd left Ding in tears. Ronnie comforted Ding but this defeat still brought about the 19-year-old trough in his early career. Ding is now a more mature player and he proved himself by winning the title last year. 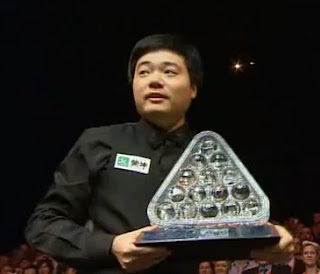 Will Ding beat Ronnie this time? Judd Trump will play Stuart Bingham in his Masters debut while another debutant Martin Gould will play his good friend Shaun Murphy. Neil Robertson drew Mark Allen and their latest meeting was the semi-finals of PTC8 last week in Ireland. Twice Masters Champion Mark Williams is up against Stephen Maguire. The current world number one as well as two-times Masters winner Mark Selby faces Stephen Lee which is a repeat of his 2008 Masters final which he won 10-3. Ali Carter comes across Graeme Dott while four-times World Champion John Higgins races against Matthew Stevens, the event winner back in 2000.